On the night of September 16, 2003, Ryan Malcolm's life as he knew it was about to change. 3.3 million votes from all across the country had been counted. At approximately 9:50pm, host Ben Mulroney prepared both Ryan and fellow finalist Gary Beals for the moment that Canada had been waiting for. "The first Canadian Idol is...none other than...Ryan Malcolm." The journey through the Canadian Idol competition for Ryan was a long one. 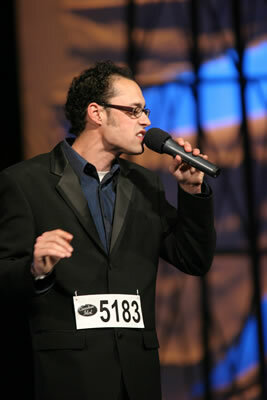 From the day he auditioned for the judges in Ottawa to the final showdown in Toronto, he faced incredible odds and even battled one elimination, only to grab one of the two available wild card spaces (the votes were very close between him and Toya Alexis, so the decision was made to add the second wild card spot) and fight his way to the top. Throughout it all, even though relegated to the wild card round after being voted out of the Top 30, he gradually improved and began to catch the eye of not only the judges, but the audiences that packed the Metro Convention Centre on competition nights and the viewers across Canada as well. And as he grew in confidence and talent, so did his fan base. During the final showdown on September 15, he dazzled the crowd with his strong performances and earned the respect of the judges and the viewers. Now Ryan's journey continues as he released his first single and his debut album. He also received the chance to represent Canada in World Idol, a special featuring winners from shows all around the world and is now about to release an album with his new Toronto-based band, Low Level Flight. Ryan should be congratulated on all of his successes and we wish him best of luck in his future endeavors as the very first Canadian Idol. Wildcard Round: "Just The Way You Are"
Top 8-Motown: "For Once In My Life"
Top 6-Summertime Hits: "Drift Away"
Top 5-Elton John: "I Believe In Love"
Top 4-Love Songs: "Crazy", "Hooked On A Feeling"
Top 3-Judges'/Idol's Pick: "He Ain't Heavy...He's My Brother", "Moving Out"
Top 2: "Something More", "Down On The Corner", "Stand By Me"